LAS VEGAS--(BUSINESS WIRE)--Jan. 7, 2014-- SLEEP NUMBER today introduced a breakthrough advancement in sleep technology at the International Consumer Electronics Show (CES) with the Sleep Number® x12 bed – the most technologically advanced bed in the world. The Sleep Number x12 bed provides consumers with simple and intuitive knowledge of how they slept and what changes they can make to achieve their very best sleep the next night and beyond. Empowering the user to make those adjustments to achieve their best sleep. "We've given consumers the ability to better understand their sleep combined with increased comfort and adjustability," said Annie Bloomquist, senior vice president and chief product officer, Sleep Number. "The revolutionary Sleep Number x12 with SleepIQ technology™ is the ultimate integrated sleep experience that takes the mystery out of sleep and empowers consumers with the information they need to improve their sleep, and therefore, their lives." In addition to SleepIQ, the Sleep Number x12 bed combines three other new and proprietary technologies with the company's core DualAir™ technology to deliver the ultimate, comfortable sleep experience. The integrated x12 technology provides consumers with the knowledge and the ability to know better sleepSM. In recognition of its outstanding design, innovation and consumer value, the x12 bed was selected as an Honoree in the 2014 CES Innovations Awards in the two categories entered: Home Appliances and Health and Fitness. 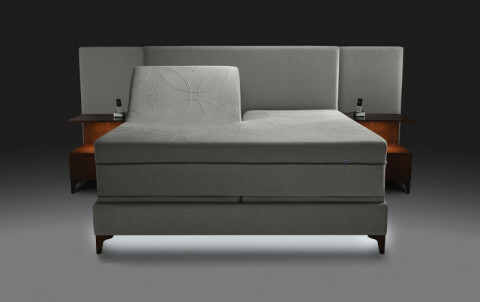 The x12 bed will be featured at Sleep Number's booth during CES in Las Vegas Jan. 7-10, 2014 (LVCC South Hall 2, #26729). The x12 bed is the first Sleep Number bed to offer SleepIQ technology – a proprietary, touch-free, non-intrusive and intuitive technology that was developed by Sleep Number and its partner BAM Labs. Rooted in medical-grade technology and integrated into the Sleep Number bed's advanced DualAir™ technology, the SleepIQ system™ comprehensively monitors presence in bed, average breathing rate, movement and average heart rate. A proprietary, full-body algorithm assesses quality of sleep and provides a SleepIQ score™ for each sleep partner, every night. SleepIQ technology studies SleepIQ score trends over time, and tells each person what level of comfort and support – their Sleep Number setting – ensures their best sleep. Using the journal feature and the SleepIQ data, individuals can track and identify routines that affect their sleep – such as exercise, caffeine and TV – and be empowered to make adjustments to achieve their best sleep. The Sleep Number x12 bed provides limitless adjustability and individualization. At the heart of the x12 bed is advanced DualAir technology. Adjustable air chambers and a Firmness Control system allow consumers to easily find their ideal level of comfort and support on each side of the bed – their Sleep Number setting. Exclusive FlexFit™ technology enables consumers to raise or lower their upper and lower body for ultimate comfort. FlexFit technology also goes far beyond simple articulation and includes a Partner Snore™ feature, several massage settings, under-bed lighting, and a timer that can be set to return the user to a favorite massage or sleeping position, or turns off the lights on their night stand. Additionally, with the introduction of the x12 bed, Sleep Number is offering an exclusive FlexTop™ mattress design option, which allows each sleep partner to adjust their elevation to their preferred position while keeping a feeling of togetherness. Finally, the communication platform of the x12 bed brings together all these technologies and provides control through a single, universal remote, or with simple voice commands. The communication platform is designed for future features and software upgrades to be seamlessly pushed to the consumer. The x12 bed will be available in pilot markets in February and will be available nationwide in the coming months. Prices start at $7,999.99. For more information, visit www.sleepnumber.com/x12. The company plans to make several of the new, exclusive technologies found in the x12 bed available across the entire Sleep Number bed line in the coming months. "Our mission is to improve lives by individualizing sleep experiences, and continue to deliver meaningful sleep benefits at a wide range of price points," explained Bloomquist. Consumers can only find the individualized benefits of Sleep Number beds and bedding at one of the 423 Sleep Number stores. Sleep Number employs more than 3,000 Sleep Professionals who are dedicated to helping customers find better sleep for life. Select Comfort Corporation is leading the industry in delivering an unparalleled sleep experience by offering consumers high-quality, innovative and individualized sleep solutions and services, which include a complete line of SLEEP NUMBER® beds and bedding. The company is the exclusive manufacturer, marketer, retailer and servicer of the revolutionary Sleep Number bed, which allows individuals to adjust the firmness and support of each side at the touch of a button. The company offers further individualization through its solutions-focused line of Sleep Number pillows, sheets and other bedding products. And as the only national specialty-mattress retailer, consumers can take advantage of an enhanced mattress-buying experience at one of the 423 Sleep Number stores across the country, online at www.sleepnumber.com, or via phone at (800) Sleep Number or (800) 753-3768.